In 1953, WHITING designed and built the first DryFREIGHT door. Today there are hundreds of thousands of vans and trailers that use Whiting's DryFREIGHT door. The DryFREIGHT roll-up door panels are constructed from 7-ply premium-grade North American lumber, and utilize a smooth exterior veneer in order to increase the longevity of the panel, as well as, create a smooth surface for paint or graphics. The standard primed finish is suitable for branding decals or graphics. WHITING Canada also offers a wide range of automotive-quality paint finishes. For even more durability and strength, a bright annealed stainless steel (BASS) finish is also available. The DryFREIGHT from WHITING Canada is a high quality yet cost-effective door solution. Since the DryFREIGHT door uses all standard WHITING components, parts are easily accessible from coast to coast. 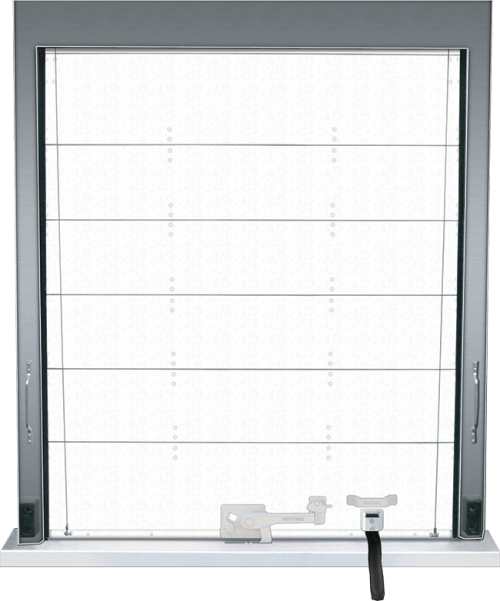 The DryFREIGHT™ is compatible with the CommandLIFT® power door-lift system.